The United Nations University Institute for the Advanced Study of Sustainability (UNU-IAS) and IUCN’s World Commission on Protected Areas (WPCA) co-organized a session titled “Nature-Culture Linkages: Managing Bio-cultural Landscapes and Connectivity” as a part of Stream 7: Respecting Indigenous and Traditional Knowledge and Cultures at the IUCN World Parks Congress 2014 on Friday, 14 November 2014 in Sydney, Australia. 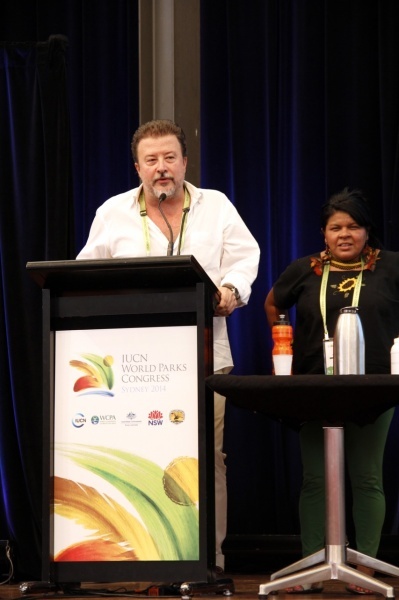 The session focused on the increasing recognition that indigenous and traditional knowledge and land-use practices by communities in bio-cultural landscapes inside and neighbouring protected areas are getting for their potential contributions to preserving biodiversity. Although indigenous communities and other stewards of protected areas may be equipped with legal instruments, in some cases resource constraints and other issues can make it difficult for protected areas to realize their intended effects. Session participants therefore discussed the importance of recognizing the need for cooperative management of production landscapes as buffer zones and corridors that border and surround protected areas. The larger overall aim of the session was to stimulate discussion and solicit suggestions regarding the significance of bio-cultural landscapes, MAB and other protected landscapes, customary uses of biodiversity, and the concept of socio-ecological production landscapes and seascapes (SEPLS) as defined by the Satoyama Initiative. The session was co-chaired by Ms. Jessica Brown of IUCN-WCPA and Dr. Pablo Eyzaguirre of Bioversity International, with facilitation by Mr. William Dunbar of the United Nations University Institute for the Advanced Study of Sustainability (UNU-IAS). Ms. Brown took the stage first, to provide an overall view of the concept of bio-cultural landscapes and the main themes to be addressed during the session, followed by Mr. Dunbar, who gave a brief explanation of the Satoyama Initiative and then an overview of the programme for the session. 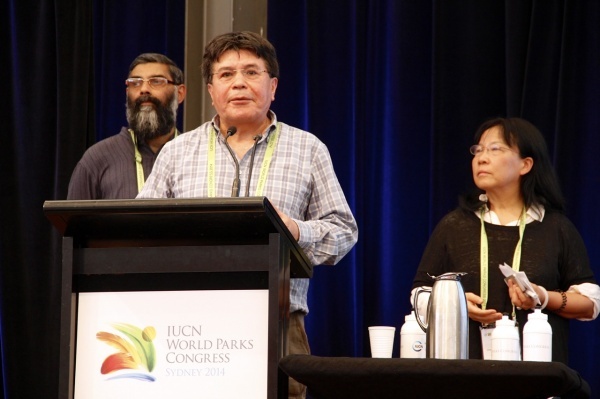 Dr. Eyzaguirre also spoke briefly on the development of a publication, the “Toolkit for the Indicators of Resilience in Socio-ecological Production Landscapes and Seascapes), which was launched at the World Parks Congress. The first full presentation was given by Mr. Alejandro Argumendo of Asociasion ANDES in Peru, who screened a new video on “biocultural heritage landscapes” in his area and then spoke on “Biocultural landscapes in the Andes: El Parque de la papa in Cusco, Peru”. The Potato Park (el Parque de la Papa) is a project in Peru, in which many species of potatoes are preserved through their cultivation using the traditional knowledge of the indigenous peoples of the area. The Potato Park has been a great success as a protected area, a production landscape and a repository of local knowledge for years. It is now in the process of being replicated in other parts of the world, and Mr. Argumendo was joined in his presentation by Ms. Yiching Song of the Chinese Academy of Sciences, who is developing a Seed Park in China, and Mr. Ajay Rastogi of the SIFOR Program, who is working on a Bean Park in India. 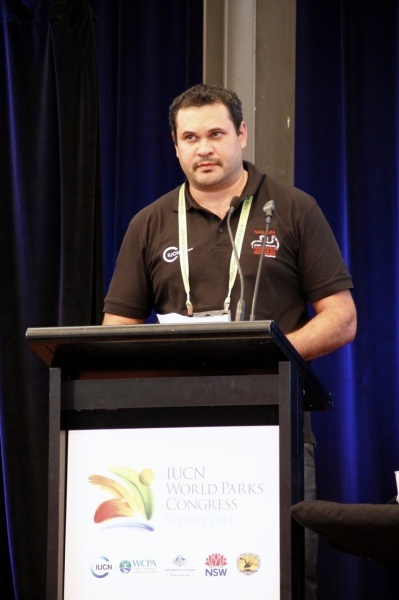 Mr. Jaime Sequeira Jr., Coordinator of Environmental Management in the Indigenous National Foundation of Brazil and National Coordinator of the GEF Indigenous Project in Brazil, spoke next on “Strengthening of indigenous lands in Brazil”. He gave an overview of the situation of indigenous peoples in Brazil and the issues they face, including deforestation and increasing encroachment from agriculture. He then explained how this is attempted to be addressed through the “National Policy of Environmental and Territorial Management of Indigenous Lands in Brazil (PNGATI)”. He was also joined by an indigenous representative from Brazil, Ms. Sonia Bone Guajajara, Coordinator of Articulation of Indigenous Peoples of Brazil (APIB), who provide some more ground-level perspective from her twenty years of work with indigenous issues. The third main presentation was given jointly by Mr. Fidi Alpers, who leads the Integrated Rural Development and Nature Conservation (IRDNC) programme in Bwabwata National Park, and Mr. Thaddeus Chedau and Mr. Alfred Chadau, both of whom are practitioners of traditional medicine from the Khwe community in Namibia. The presentation was titled “Fire brings new Life – Buffalo’s in the smoke: a case-study of Traditional Ecological Knowledge from Namibia”, and focused on the role that fire can have in sustainable management of the landscape when used in keeping with local knowledge, in spite of its common negative image. Mr. Alpers stressed the need for local practitioners to have tenure over their own landscapes for sustainable management, particularly where outside policymakers may not understand the needs of the local context, creating, for example, blanket bans of fire-based agricultural practices. Mr. Ricky Archer, Acting Regional Mapping Services Coordinator at the Northern Gulf Resource Management Group in Australia, acted as discussant for the three presentations, providing perspective from the local context and the long struggle that indigenous Australians have had to gain control over landscapes and natural resources in the country. He pointed out many of the similar issues faced by indigenous groups around the world, and the need for protected areas to resolve difficult issues, particularly including areas under management by the local indigenous groups. The event was well-attended by around 80 people despite the high temperature in the outdoor venue, and the following discussion session included contributions from a wide variety of attendees from around the world. The final wrap-up by Dr. Eyzaguirre helped to bring together the various perspectives introduced in the event by focusing on various interrelations, between production and protected areas, between different components of the landscape, between traditional and administrative managers of protected areas, etc. The session as a whole served as an excellent opportunity for many to consider the potential for sustainable agricultural practices in indigenous control of biocultural landscapes, which are often considered more simply in terms of rights to natural resources.